TopBet is an online gambling presence that has been active in casino and sportsbook betting since early 2011. They have established themselves as a serious contender in the US friendly online gambling space, and we felt it worth our time to check them out. We found their selection of betting lines to be sufficient with a nice range of sports covered in their lineup. They also offer a nice range of betting options and types, including live betting and live in play betting. We found their customer support to be knowledgeable and responsive to our inquiries, though we do wish they offered a live chat function. All in all they hold their own in the online sports betting space, and offer a pretty nice casino to boot. Update 2016: We've moved Topbet down in rating due to a few players having problems getting paid. Topbet has stated that the cause for payment delays are due to processing issues and not lack of funds. Anyone that is familiar with the gambling industry in the US understands that these things happen and sometimes processing companies have major issues with paying US players. At the end of the day, we feel the issues are infact due to the processing company and not due to their liquidity. So we still feel like they are a good choice for US players, but wanted to mention the payment issue just the same. In addition, Topbet has recently added Bitcoin as a viable option for both deposits and withdrawals. So not only are all players getting paid, they are collecting their funds in record times now that Bitcoin is in the mix. If you aren't familiar with this option, you can learn more on our Bitcoin sports betting page. TopBet.eu is licensed and regulated through the Government of Curacao. Along with meeting minimal licensing requirements, TopBet also must comply with unannounced audits of their fair gaming practices, software and business operations. Because of their commitment to transparency, you can verify their standing with the Gov't of Curacao to confirm that they are licensed and legally authorized to provide gambling services by viewing their licensing information from their website. They operate under Master Licensing of Gaming Services Provider, N.V. #365/JAZ. Because TopBet.eu is licensed and regulated outside of the United States, they are not subject to US federal laws and can legally offer their services to American players. Sports bettors in the US are not violating any US federal laws by participating in legally licensed offshore online gambling. TopBet has paid attention to detail when it comes to incentives. Like all smart businesses, they understand that when you show them the money, they will come. Their initial new customer sports betting sign up bonus a 100% match bonus up to $1000 on your first deposit. All players will also receive a 10% reload bonus on all future deposits automatically. In addition, Top Bet offers a number of special promos, such as their Thursday Quick Cash Reload Bonus where they will offer a 30% match bonus on all QuickCash deposits made between Tuesday and Thursday at 5PM. For this bonus, you must call customer support prior to making your deposit in order to claim the offer. Should you refer your friends and family to TopBet, they reward you with a 25% match bonus worth up to $250 for each referral. Finally, they also offer special reload bonuses by invitation only. We must admit, the banking suite at TopBet offers a menu of deposit methods that is short and sweet. They accept four types of online payment solutions, including Visa, MasterCard, Bitcoin and QuickCash. Visa and MasterCard are self explanatory, and QuickCash is a money transfer service facilitated through Western Union. QuickCash boasts a 100% acceptance rate among USA players. You must call their cashier in order to initiate the QuickCash funding option. When it comes to Visa and MasterCard, Top Bet accepts debit cards, gift cards and personal credit cards that depict the Visa or MasterCard logo, and they utilize the Verified by Visa and MaterCard SecureCode enhanced security features to protect our transactions. The security profile at Top Bet that protects all customer data and transactions exceeds both licensing requirements and industry standards through advanced data encryption and antivirus and firewall protection. Payouts are handled through one of several options, including check by courier, Bitcoin and verified credit or debit card. This sportsbook offers a comprehensive approach regarding their range of sports coverage. You will find the following sports categories as viable betting options at TopBet's sports betting portal: NFL Football, NCAA Football, NBA Basketball, Baseball, Hockey, Mixed Martial Arts, Soccer, Tennis, Golf, Entertainment (this includes reality TV shows and political wagering), Rugby, Cricket and UEFA. 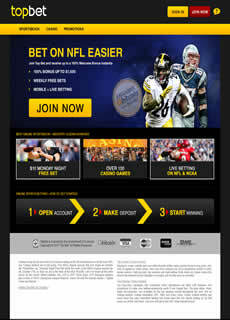 Wagering options provide additional variation, with a strong menu of betting types, offering both standard and advanced wagering, including point spreads, moneylines, over/under, parlays, prop bets, futures bets, teasers, betting props, buying points, If bet, Action reverse bet, win revers bet, Asian handicap and progressive parlays. They also offer nice live betting features as well. The betting limits vary by sports category and wagering type, and with the majority capping out at either $500 or $1000. NFL and NCAA football both carry $2000 betting limits for the standard wagers, and you will find a $100, $200 or $300 limit sprinkled through out the lines across multiple sports as well, but those are scarce. Betting limits are in place to protect all parties involved. High rollers who want to place wagers exceeding the limits should contact customer support and make an official request. TopBet has included live betting features in their gaming platform. This type of option allows players to bet on the game during game play, and adds a distinctive element of excitement to the process. You may enjoy live betting through their traditional website or through their mobile initiative. Not all sports are included in the live betting range of lines, so be sure to investigate availability ahead of time. Being a top flight operation, Topbet offers a robust mobile betting platform that is compatible with all major smart phones. We don't need to go into too much detail here as much players understand the value in betting with a site that offers mobile wagering on the go. Legitimacy – they are legally licensed and regulated and able to legitimately offer their services to anyone, anywhere, including to players in the US. They hold the appropriate credentials to ensure they are operating legally within the industry. Reliability – we found their software, customer support and cashier to all be committed to establishing themselves as a reliable and customer oriented service provider. Thus far we have not experience any types of technical issues, glitches or time outs when logged into TopBet.eu. Quality – TopBet delivers a highly impressive user interface, an intuitive and user friendly betting process, and glitch free gaming software. We are extremely pleased with the site's performance and look forward to many enjoyable moments as registered players.